25/26 November 41–who attacked strongpoint 903? While going through the events of the night of 25/26 November 1941 outside Tobruk (confusing enough), I came across a puzzling entry in the war diary of Division z.b.V. (later 90th Light). 21.00 – 02.00 attack by English assault detachments in bright moonlight on strongpoint 903, and around 24.00 hours on strongpoint 20, which was taken. In the early morning hours the men who succeeded in getting out after destroying their weapons get back to the divisional command post. The map below, from the war diary of Division z.b.V. shows the layout of the divison’s strongpoints on 25 November. I have indicated the location of actual attacks and who carried them out, and also where position 903 was located. 21.00 attack by 2 Yorks and Lancasters supported by A Squadron 4 RTR on objective WOLF (formerly known as GRUMPY, and named ‘Fico’ (Fig tree) by the Italian Bologna division which provided the garrison). This attack got completely stuck and the infantry suffered heavy losses. A renewed attack in the morning was required to take out the strongpoint. 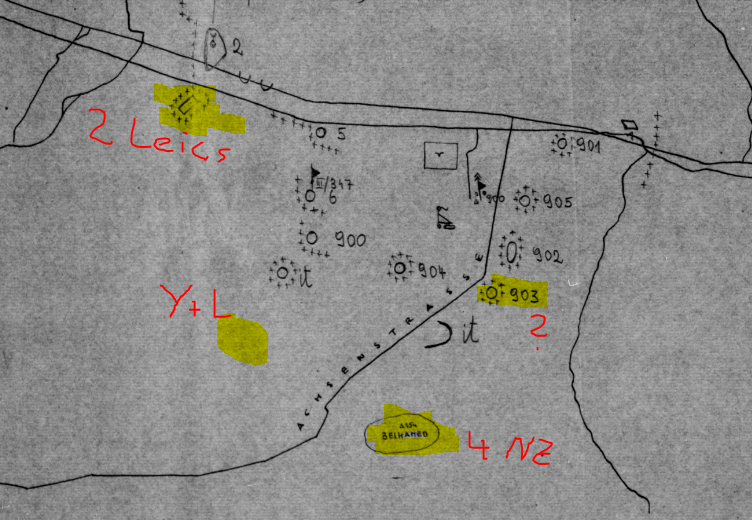 21.30 attack by 2 Leicesters supported by D Squadron 7 RTR against position 20 (upper left – unnumbered). This area did not seem to have a code-name, but was referred to as the ‘wrecked plane’ area, after a Junkers wreck lying to the east of it, even though I believe that at least part of the strongpoint was covered by the area code-named HARRY. This attack got stuck. In the morning when it was renewed it was found that the Germans had abandoned the position. 22.00 approach march by 18 and 20 NZ Battalions commences, and ‘before midnight’ the battalions are on the northern slope of Belhamed. The map below shows the approach march, it is taken from the NZ Official History. This was objective LEOPARD. The attack was completely successful. The only Allied element that came even close to 903 was Lt.Col. Kippenberger’s party, which had lost it’s way and ended up about 1km north of Belhamed at some point. It reports that there were Germans who were captured by Lt. Baker’s LAA men who were accompanying Kippenberger’s party. While it is possible that this was mistaken for an attack by the garrison of strongpoint 903, but it is quite a way away. When I get around to it I will provide a write-up of the engagements for the two objectives of 70 Division. In the meantime, if someone has an answer to who or what attacked strongpoint 903, I’d love to hear it. I am sure it is something eminently simple that I have just overlooked! This entry was posted in Content and tagged 2 Leicesters, 2 Yorks and Lancs, 4 NZ Brigade, 4 RTR, 70 Division, 7th RTR, 90th Light, Divisione Bologna, Tobruk. Bookmark the permalink. Do we know what the Commonwealth called strongpoint 903? Not sure it ever had a name. It was a new position created on 25 November. I’ll see what Frank Harrison’s book has to say about it tonight, there might be something there…..
On the map of the war diary. I guess the 9xx positions represent platoon positions of 900 pioner abt ? Do you know what represent the other simbols? Up and to the right there is a romboid simbol like a tank? 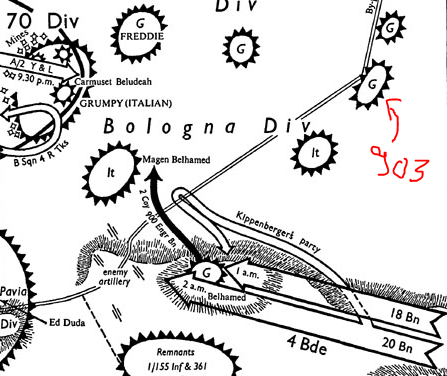 It is possible that 900 was originally a position of Pionierbatallion 900, but at this stage I think they had moved south, even though the CP of the unit had remained opposite 905 – I will check. I think it is possible that Kippenberger’s party ran into them when the Germans withdrew north from the attack of 6 NZ Brigade. The other strongpoints (903/904) were occupied by various elements of Division z.b.V. 903 was occupied by a force under Hauptmann Kolbeck – we’ll meet him later on the slopes of Ed Duda. https://rommelsriposte.com/2009/02/08/batallion-kolbeck-the-wrong-tool-for-the-job-on-ed-duda/ Panzerjaeger Abteilung 605 was in the centre of the position. 2, 5, and 6 are original strongpoints from before 21 November. The NZ artillery history suggests a fair amount of confusion during that night and I wonder if it may have been one of the recce parties of the NZ Field Regiments.